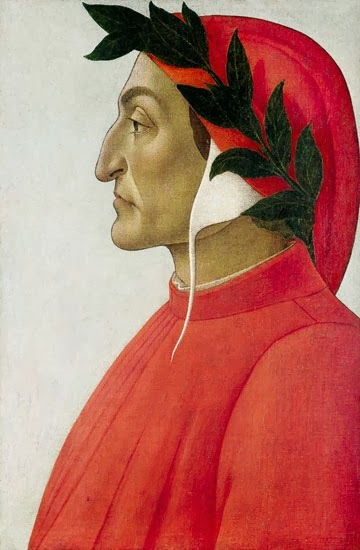 Dante Alighieri (1265–1321). Purgatory, The Divine Comedy. Dante fell madly in love with Beatrice at first sight; but it is doubted if he ever spoke to her in this world. He tells of his happy meeting with Beatrice in Paradise. ARGUMENT.—Beatrice descends from Heaven, and rebukes the Poet. Flowers overhead and round them on all sides. The power of ancient love was strong within me. My undew’d cheeks from blur of soiling tears. Veil’d in that festive shower angelical. Approach the mountain? Knewest not, O man! Gush’d, through the lips and eyelids, from the heart. Mar it the more, and make it run to wildness. I was less dear to him, and valued less. Did call him back; of them, so little reck’d him. Received my supplications urged with weeping. Note 1. The seven candlesticks of gold, which he calls the polar light of Heaven itself, because they perform the same office for Christians that the polar star does for mariners, in guiding them to their port. Note 2. “Come with me from Lebanon, my spouse, with me, from Lebanon.”—Song of Solomon, iv. 8. Note 3. Blessed is he that cometh in the name of the Lord.”—Matt. xxi. 9. Note 4. “But.” They sang the thirty-first Psalm, to the end of the eighth verse. What follows would not have suited the place or the occasion. Note 5. The oblivion of sins. ARGUMENT.—Beatrice continues her reprehension of Dante, who confesses his error, and falls to the ground; coming to himself again, he is by Matilda drawn through the waters of Lethe, and presented first to the four virgins who figure the cardinal virtues; these in their turn lead him to the Gryphon, a symbol of our Saviour; and the three virgins, representing the evangelical virtues, intercede for him with Beatrice, that she would display to him her second beauty. Enclosed me, and are scatter’d now in dust. Acknowledging their fault, and self-condemn’d. I mark’d the secret sting her words convey’d. Swift as a shuttle, bounding o’er the wave. Where, turn’d toward us, Beatrice stood. Still fix’d toward the Gryphon, motionless. Thy second beauty, now conceal’d.” O splendour! Thou gavest to open air thy charms reveal’d? Note 2. “For a slight girl.” Daniello and Venturi say that this alludes to Gentucca of Lucca, mentioned in the twenty-fourth Canto. Note 3. “Bird.” “Surely in vain the net is spread in the sight of any bird.”—Prov. i. 17. Note 4. “From Iarbas’ land.” The south. Note 5. “The lady.” Matilda. ARGUMENT.—Dante is warned not to gaze too fixedly on Beatrice. The procession moves on, accompanied by Matilda, Statius, and Dante, till they reach an exceeding lofty tree, where divers strange chances befall. Against the sun and sevenfold lights, their front. Whose orbit, rolling, mark’d a lesser arch. There, left unto the stock whereon it grew. The plant, erewhile in all its branches bare. Unearthly was the hymn, which then arose. The manner of my falling into sleep. “Beneath the fresh leaf, seated on its root. Behold the associate choir that circles her. From blast septentrion and the gusty south. And now to larboard, by the vaulting waves. The four. Like monster, sight hath never seen. Shielded the harlot and the new-form’d brute. Note 1. “Their ten years’ thirst.” Beatrice had been dead ten years. Note 3. “The blossoming of that fair tree.” Our Saviour’s transfiguration. “As the apple-tree among the trees of the wood, so is my beloved among the sons.”—Solomon’s Song, ii. 3. Note 5. “The piteous one.” Matilda. Note 6. “Those lights.” The tapers of gold. Note 7. “Of that true Rome.” Of Heaven. Note 8. “To that place.” To the earth. Note 9. “The bird of Jove.” This, which is imitated from Ezekiel, xvii. 3, 4, is typical of the persecutions which the Church sustained from the Roman emperors. Note 10. “A fox.” By the fox probably is represented the treachery of the heretics. Note 11. “With his feathers lined.” In allusion to the donations made by Constantine to the Church. Note 12. “A dragon.” Probably Mohammed; for what Lombardi offers to the contrary is far from satisfactory. Note 13. “With plumes.” The increase of wealth and temporal dominion, which followed the supposed gift of Constantine. Note 14. “Heads.” By the seven heads, it is supposed with sufficient probability, are meant the seven capital sins: by the three with two horns, pride, anger, and avarice, injurious both to man himself and to his neighbor: by the four with one horn, gluttony, gloominess, concupiscence, and envy, hurtful, at least in their primary effects, chiefly to him who is guilty of them. Note 15. “O’er it.” The harlot is thought to represent the state of the Church under Boniface VIII, and the giant to figure Philip IV of France. Note 16. “Dragg’d on.” The removal of the Pope’s residence from Rome to Avignon is pointed at.